8 May 2018, Bengaluru: Kenya’s Geoffrey Kamworor and Ethiopia’s Netsanet Gudeta took the honours at the IAAF World Half Marathon Championships Valencia 2018 just a few weeks ago and the TCS World 10K Bengaluru 2018 race promoters, Procam International, are proud to announce that both world champions will head the men’s and women’s elite fields respectively, at this year’s race on Sunday 27th May. For both runners, it will be their first competitive outing since their global triumphs on 24 March. Kamworor, 25, has established himself as one of the world’s leading distance runners in recent years, winning the last two the world cross country and the world half marathon titles. “I took some rest after Valencia and before starting my preparations towards Bengaluru. I hold the course record at this race (27:44) so I know about the course and the city. 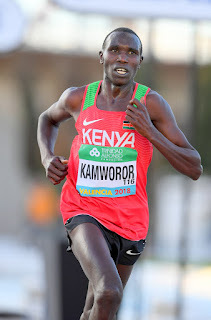 I have some very good memories about running in India and I have also run in Delhi in the past, so I am looking forward to the race,” commented Kamworor from his home in Kenya. “People will be asking me about times and whether I can run another course record, but I just want to come to Bengaluru to run a nice race, especially as there will not be any pacemakers this year.” . “I expect the organizers, Procam International, will have some other strong runners in the race so I am sure will have a good battle,” he added. “I have been to India on a number of occasions in the past, including this race and three times at the Airtel Delhi Half Marathon, but I have never won a race in India so my ambition is first and foremost to win in Bengaluru this year. “I know after winning in Valencia that people will be talking about a fast time and perhaps the course record (held by Kenya’s Lucy Kabuu at 31:46 since 2014), but this year there are no pacemakers. “Of course, I set the women-only world record for the half marathon (1:06:11) in Valencia and that was a race without pacemakers. I have also run times for 10,000m on the track (personal best 30:36.75, 2016) and 10km on the road (31:35, 2017) that are better than the course record but the most important thing for me is to win,” she reflected. The rest of the men’s and women’s elite fields for the TCS World 10K Bengaluru 2018 will be announced in the coming weeks. The TCS World 10K Bengaluru 2018 has a total prize fund of US$213,000 and it has risen in prominence every year since it was inaugurated in 2008 and is now one of Asia’s leading races over this distance-category. Approximately 27,000 runners will take to the roads for five different races in what has become one of Bengaluru’s most high-profile sporting events. In addition to the TCS World 10K for elite runners, there is an Open 10K, the Majja Run (6km) the Senior Citizens’ Race and Champions with Disability Race (both 4km).